The Old Republic MMORPG is on the launchpad — and as players of the beta are now able to report, there is at least one familiar name to be found: Carrick Station, an important hub. The game's site is here; Google a bit, and you'll get a look at the location itself. 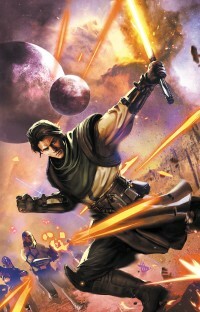 I've been asked a few times already about whether there's a direct in-universe connection between that naming and the Carrick from the Knights of the Old Republic comics. It's not my project to speak to (though I have spoken with the fine folks behind it), so all I can really do here is state what everyone already knows. There are many years between the settings, and a lot of Carricks in the galaxy — including in Zayne's family alone! — so there may be a connection, or maybe not. Time will, of course, tell — time, and the stories in between! Which is a good reason to get your order in for Star Wars: Knights of the Old Republic — War #1 at your local comics retailer. Zayne as we knew him wasn't a very popular person with the Republic — nobody was going to be naming anything after him. But his life is about to change again, drastically. Could he finally be in line for the acclaim his actions deserve — or will things go from bad to worse? With Zayne's luck, you never know! There are several fun callback nuggets in the TOR game, or so I've been told — including even in the server names, I'm told. (Update: Look in the comments here for a whole bunch of them, from Dreypa's Oubliette to Rohlan Dyre.) Enjoy the game — less than a month now until it goes live for everyone! Any hint on how long after KOTOR#50 the new series will start? Is it going to be numbers "#51 in a series" in the indicia? As to your second question, I may address numbering in a blog post this week -- I've been meaning to blog more, anyway! I've seen a few more connections to your work in the game. A companion to the bounty hunter comments on a statue of Darth Revan, saying "I've heard Revan took that mask off a dead Mandalorian during the war", or something like that. And there is a Mandalorian whose rank is Rally Master. Weren't both your work? I love these small things readers of the comic series can spot and recognise. Interesting! The mask did come from a dead Mandalorian, though the body had been incinerated. That story was in #42. And I just came across some codex (an in-game encyclopedia) entries on the events in the comics as well, from the Padawan Massacre to the Jedi Covenant to the events of Vector. Zayne is a central focus in all of them.